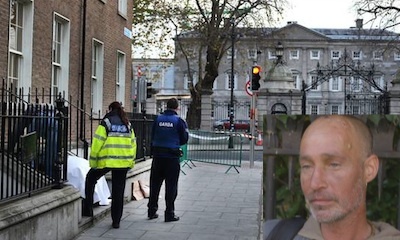 The death of Kilkenny native Jonathan Corrie, a 43-year-old who had suffered mental ill-health and addiction problems, on a freezing night within feet of the seat of power, has shocked the public may have killed off the Dublin government’s chances of re-election. Amid public anger over the plight of Ireland’s poor, the annual lighting of a Christmas tree in the grounds of the parliament at Leinster House had to be postponed. A candle lit vigil was held instead. The father of two was “ice cold” when a woman came across his body at around 8am. She said she ran across the road to get the gardai who provide security at the Dail, but they refused to get involved. Buswells Hotel later provided a white sheet to cover him from passers-by and for his dignity. Flowers and messages have since been placed outside the place where his body was found. Another said: “A little too late. It is about the billionaires we know you look after best and forget about the rest”. Several homeless sleep rough around the doorways of Molesworth Street, just across from the doors of Leinster House. Some are known to Taoiseach Enda Kenny and other TDs as they pass on their way to the Dail. Amy Malone, who organised the vigil, queried why the Minister for Public Expenditure Brendan Howlin had suddenly managed to find an extra 10 million euro to deal with the homelessness crisis following the news. “We shouldn’t have to wait for a man to die for them to do something about it,” she said. Founder of Focus Ireland Sr. Stanislaus Kennedy said Mr Corrie’s death is a sign of the ‘failure of the state’. “I’m going to say what an awful tragedy this is that somebody should die in such circumstances and so publicly and to offer my sincere condolences to the man’s family and friends,” Sr. Stan told RTE’s News at One programme. “As well as people living rough we have more and more families moving into homelessness every day,” Sr. Stan continued. Official figures released just over a week ago show the number of people sleeping rough in Dublin has soared over the past year, while homelessness and soaring rents have become a national crisis. Medical teams needed to be included to deal with mental health and addiction problems, he added. “It was heartbreaking to listen to Jonathan Corrie’s daughter and son ... saying he’d tried to get help from addiction services for years,” he said. While the housing situation has boosted economic statistics by forcing many unemployed to emigrate, others have joined the list of the homeless. Accompanying Mr Burke and security staff in a nigh-time tour of Dublin city centre on Thursday night, Mr Kenny was described as being alarmed at what he had seen. Burke said the Taoiseach was “taken aback” and “saddened” by the sight of so many homeless, and shocked that many of them were there solely due to rent hikes and job losses. Reports have also multiplied of people who have taken to living in illegal, overcrowded, slums or in vehicles. A recent ban on the provision of bedsits -- small studio apartments with shared facilities -- has also proven disastrous. Sinn Fein Councillor Chris Andrews has called for an immediate and urgent response from government to the rapidly escalating housing crisis. He said NAMA, the state ‘asset management company’, is sitting on thousands of vacant housing units because they don’t know what to do with them. “Fast tracking the delivery of NAMA housing units should be an overriding priority of this government, yet NAMA has so far delivered just over 750 vacant units for use as social housing. This is absolutely and utterly unacceptable”. Socialist TD Ruth Coppinger said the housing crisis was an epidemic. She described some of the people who had visited her constituency office. “A man in his 60s who is a former plasterer, is now homeless. He has diabetes and arthritis and goes out to the airport to sleep at night,” she said. Colleague Paul Murphy said the recent anti-water charge protests held in recent weeks have shown people power. Thousands have been attending demonstrations every weekend across the country. A poll this weekend showed Kenny’s party at a historic low of just 19% support, a slide of 5%, while his Labour coalition partners fell by 3 points, from 9% to 6%. Meanwhile, there has been a strong rise of 9% in support for independents and others, to 32%. Sinn Fein remain the most popular party in the state at 22%, with Fianna Fail close behind on 21%. Murphy urged as many as possible to turn out on Wednesday, when another mass protest is to be held in Dublin city centre. “It isn’t just about water. This is about who paid for the last six years and who paid the gambling debts of an anonymous elite [bank investors] whose names have never been revealed,” she said. She dismissed claims some protests have been aggressive. “Joan Burton wonders why she drove into Jobstown, one of the most deprived communities in this country and a red carpet wasn’t flung under her feet? Because you’re the Minister for homelessness, Joan,” she said. * See right2water.ie for further details of Wednesday’s and other protests.